On 7 February 2014, Jason Lamy-Chappuis will be the first French athlete to enter Sochi’s Olympic Stadium, as the proud flagbearer of his nation’s delegation. A few days later he will switch his attentions to the RuSski Gorki Jumping Center to begin the defence of his Olympic Nordic combined title, the first of three golds that the Frenchman will be hoping to win at Sochi 2014. Sure enough, his improvement curve over subsequent FIS World Cup campaigns was palpable. Blessed with excellent jumping technique, the Frenchman improved his physical strength and was soon recording some impressive victories. 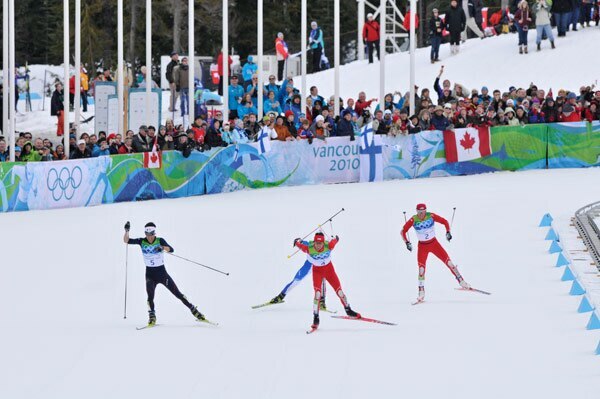 Already with one hand on the 2009-2010 Nordic Combined Crystal Globe by the time he arrived at Vancouver 2010, his Olympic love affair was consummated on Valentine’s Day when he got the better of an intense sprint duel with the USA’s Johnny Spillane to claim individual gold on the normal hill. After that he embarked on a winning streak that saw him win the overall title in the Nordic Combined World Cup three seasons running (2009-2010, 2010-2011 and 2011-2012).He also claimed the 2011 World Championship title on the iconic large hill at Holmenkollen, Oslo, and two years later at the 2013 Worlds in Val di Fiemme he bagged a remarkable hat-trick of gold medals (in the 10km normal hill, team normal hill and team sprint). “I felt I had to do justice to my Olympic title. I had to keep my place as world number one, and that needed all my concentration. That gave me a great deal of pleasure,” he beams. Follow Jason Lamy-Chappuis on the Athletes' Hub.